Diwali Mahotsava is being organized at Sector-11, near sports complex from 22nd October to 2nd November, 2010. It has full entertainment bonanza for Dwarkaites. There are various rides like colambus, dragon train etc. are the main attraction for the children. Mr.Santosh Kumar Saras informed Dwarka Parichay that more than 50,000 free entry passes were distributed in every schools of Dwarka specialy for the childrens. Around 100 stalls of different household useful items and food stalls are pulling the crowd. Mr.Santosh further added that they have a dedicated team of 35 members who are taking care of the fair and 5 cctv cameras are installed for the safety of the crowd round the clock. The event was inaugurated by Mr. Onkar Singh Thapar Chairman of Punjab State Industrial Development Corporation Ltd.& Mr. Praveen Kumar mostly known as Bheem of Mahabharat TV. Serial. 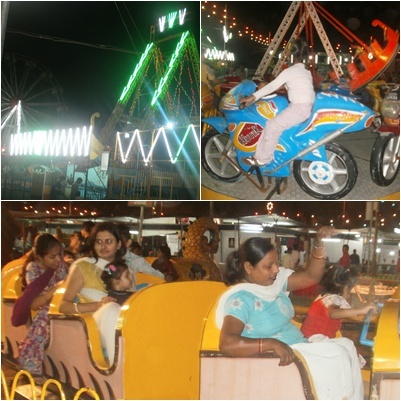 Talking to Dwarka Parichay Mohini a resident of Sector-22 feels that this is the best platform for the whole family to enjoy the rides & shopping at the same place. Ms.Ramneet – garment exporter (ladies garments) who is also exhibitor is very much happy to get the overwhelmed response from Dwarkaites. Ms.Shalini Rajan – the young and creative artist also displayed her excellent piece of painting and attracting art lovers. The fair is organized jointly by Showmaker & Peacemaker, Bihar Plus is the media partner and Octopus Inc. –communication partner. Lohri celebration in Dwarka on 13th Jan.